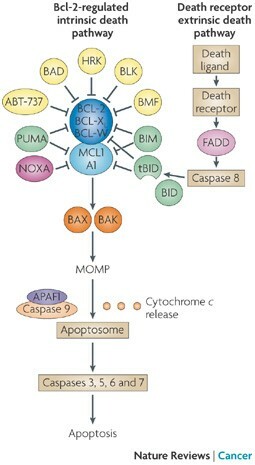 Update: Follow the link for a nice primer on apoptosis, BCL-2, and BH3 Mimetics. Dr. Sharman’s CLL & Lymphoma Blog – What is BCL-2 and why should we inhibit it? “Chronic lymphocytic leukemia (CLL) is characterized by the deregulated accumulation and persistence of B lymphocytes in the blood. Although the exact causes of CLL are unknown, the evasion of apoptosis through aberrant expression of BCL2-family proteins is a common feature. A class of compounds, termed BH3 mimetics, has been developed to directly inhibit BCL2 proteins and selectively kill tumor cells. To date, the most successful of these compounds are the BCL2/BCLXL inhibitors ABT-7372 and ABT-263 (navitoclax), as well as the BCL2-specific inhibitor ABT-199. Results from early clinical trials with navitoclax have demonstrated single-agent efficacy in patients with relapsed or refractory CLL. However, there was heterogeneity in response rates between patients, and dose-limiting toxicities including thrombocytopenia and neutropenia which prevented further doseescalation. In addition, CLL cells residing within various microenvironments (e.g. lymph nodes and bone marrow) are resistant to BCL2 inhibitors. This resistance results from the upregulation of additional BCL2-proteins, such as BCLXL, MCL1 and BFL1, the latter two of which are not inhibited by navitoclax, and therefore protect the leukemia cells from apoptosis. Additional drugs are needed to enhance the efficacy of navitoclax. Here, we demonstrate that gossypol overcomes stroma-mediated resistance to ABT-737 without enhancing the sensitivity of normal lymphocytes and platelets.